[/av_heading] [av_textblock size=” font_color=” color=” admin_preview_bg=”] Stuart was born and raised on his family’s dry area farm north of Barellan in the Western Riverina region of New South Wales. On his 12th birthday he was given 50 acres to farm as he pleased and has been experimenting and growing a wide range of cereal grains here for more than 20 years. Moving away to University during the Millennial drought, Stuart developed a strong passion for home brewing, which then saw him travel the world seeking out high quality brewing ingredients, traditional brewing processes and unique and rare beers. 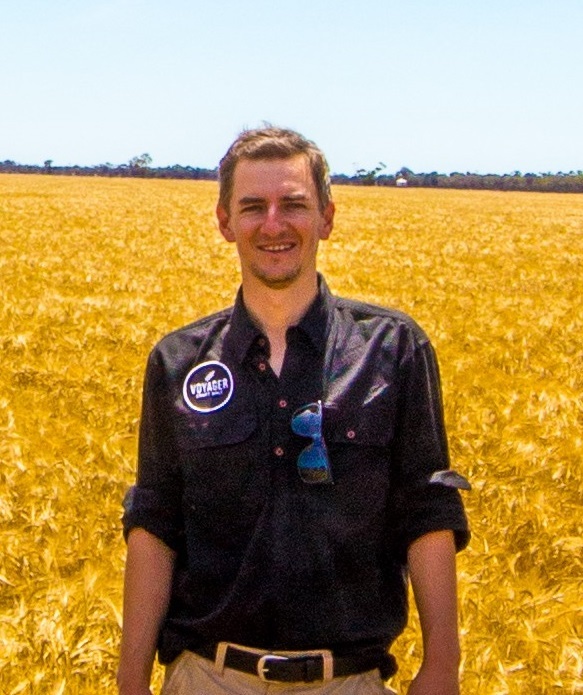 Working closely with his childhood mate and farming neighbour Brad Woolner, Stuart and Brad established the Barellan Beer Company, a Not for profit community organisation that took locally grown Barley and had it turned into a community beer ‘Golden Grain Ale’- One of the first beers in the country that had full product traceability. Due to strong demand for similar raw brewing ingredients from other craft brewers and distillers, Stuart and Brad established Voyager Craft Malt. Australian first on farm craft malthouse, creating the world’s most sustainably produced malt house which now supplies more than 25 single origin artisan malt varieties to craft breweries and distilleries around the country.